By Costa Maragos Posted: January 15, 2017 3:00 p.m.
A team of second-year students from the Faculty of Engineering and Applied Science has catapulted its way to top spot at a major design competition. This year’s theme is collaboration. 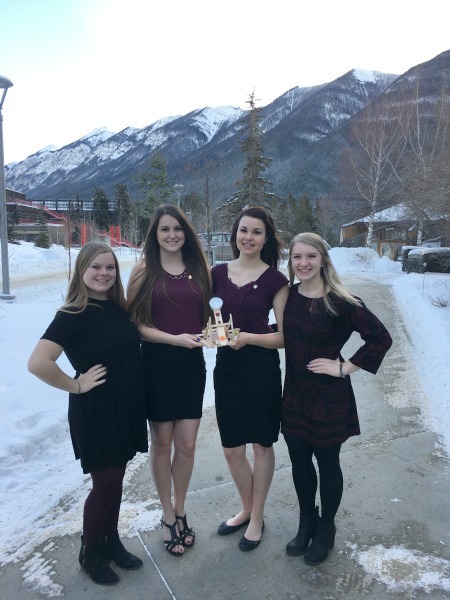 The U of R team members are Emma Fraser, (environmental engineering), Kaylee Hayko (industrial engineering), Tennille Kowalchuk (environmental engineering) and Kailey Lowe (industrial engineering). The students will now represent the University of Regina at the Canadian Engineering Competition at the University of Calgary in March 2017. The prototype was required to be designed from typical craft items. The catapult outperformed all other university teams at the Western Engineering Competition in Banff. Competitors were given four hours to brainstorm and build a prototype, which would aid search and rescue missions in the mountains surrounding Banff. The goal was to deliver supplies to stranded people before rescue personnel could arrive. That was a tall order given the prototype was to be made from typical craft materials such as popsicle sticks, plastic cutlery, string, cups and clothespins. The design impressed the panel of industry judges. The catapult was required to shoot supplies to a target at least six metres away. The U of R team outperformed all others, achieving a distance of a mere 14 centimetres from the target. “Even though our University is of one of the smaller ones in Western Canada it really speaks to our program that we are able to not only compete but outperform many larger schools. We are so proud of our team and cannot wait to compete at the nationals,” says Hayko. The U of R sent seven teams and a total of 22 students to the competition. 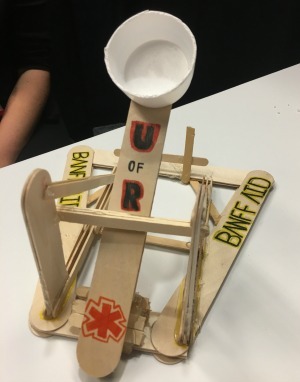 The U of R students were able to compete in Alberta thanks to the Association of Professional Engineers and Geoscientists of Saskatchewan, the Regina Engineering Students Society and the University of Regina Students Union.